A Must read to find out the back story behind Jeff's and Richard's young lives and their living together when Jeff was a teenager, and beyond. The funniest part was the prank Jeff pulled on Richard's grandmother when she barged into Jeff's room without knocking. Steven Barnett does an excellent job narrating this and all of L L. Bartlett ' s books! There are several short stories that flow from one to another. This is the backstory of Jeff and his brother Richard. We see their first meeting together an the guilt and disappointment they felt for each other. These are not happy, fun stories but a look into what shapes two men....all the lost little opportunities they had, the misunderstandings...really everyday life and how that shapes all of us. I said these weren't happy stories, at the same time their not depressing...just a look at real life and all its consequences. Now I feel like I understand the characters better and i even felt their pain. Interesting stories. The narrator is terrific and really highlighted each character. I'll want to read and listen to more stories by this author/. 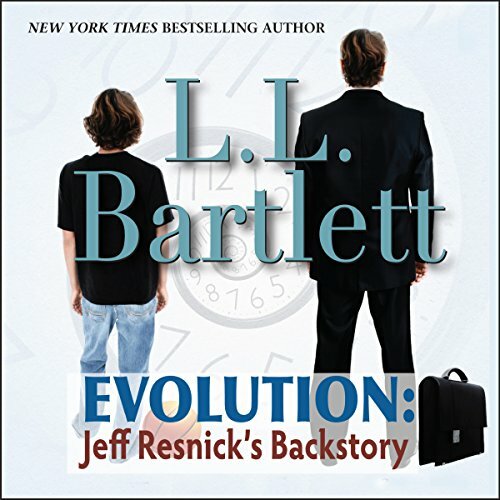 I am a fan of the Jeff Resnick novels so finding out more about the characters was not only enlightening but very entertaining. I was once again impressed with the quality of the writing and how Ms. Bartlett draws you in with her story or, in this case, stories. The narrator, Steven Barnett, was excellent as well. It always amazes me that this is the same author who writes The Booktown Mystery series, another series I love, because they are so different. There is a darkness and depth to these stories that you do not see often in a mystery series. Keep up the great work. I don't know what I would do without your novels. I found this book to be rather engaging and couldn't stop listening until I was done! I enjoy the characters in the series so listening to their backstory held my interest. The narrator also did a great job. Overall, I would recommend this book! Would you listen to Evolution again? Why? Yes, Steven Barnett brought the story to life. What was one of the most memorable moments of Evolution? When Jeff mooned Richards grandmother, just made me laugh out loud. Steven Barnett is an incredible reader! He brings the story to life and makes you feel like you are part of it.